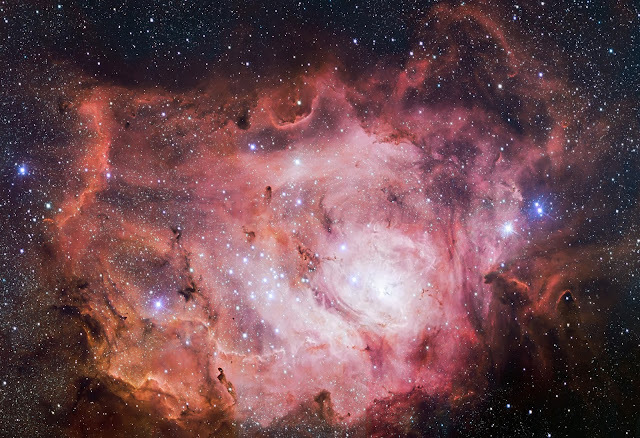 The European Southern Observatory used its VLT Survey Telescope at Paranal Observatory in Chile to capture the image of the Lagoon Nebula in rich detail. This is part of the The VST/OmegaCam Photometric Hα Survey (VPHAS+) which is one of three imaging surveys that use visible light with the VST. These are complemented by six infrared surveys with the VISTA survey telescope. There are also two other surveys that have distinct objectives; The Gaia-ESO Survey and the Public ESO Spectroscopic Survey of Transient Objects (PESSTO). The Gaia-ESO Survey uses the VLT to map the properties of more than 100 000 stars in the Milky Way. PESSTO is studying transient objects such as supernovas with the New Technology Telescope at La Silla. These surveys are used to find out more about the Universe such as the nature of dark energy, quasars, structures of galaxies and studying other objects in detail. Data from all of these surveys are now publicly available and accessible through the ESO Science Archive Facility (see related links below). The Lagoon Nebula is an interstellar cloud of dust, hydrogen, helium and other ionized gases. Nebulas are regions where stars are formed. The materials needed to form stars such as hydrogen and other gases are abundant in a nebula. Stars are formed when dust and gas start to clump together and gain mass. As the mass gets more dense and generates heat, thermonuclear fusion starts and a star starts to form. The Lagoon Nebula is an intriguing object located around 5000 light-years from us in the constellation of Sagittarius (The Archer). Also known as Messier 8, it is a giant cloud 100 light-years across, where new stars are forming within its plumes of gas and dust. This new 16 000-pixel-wide image is from the VLT Survey Telescope (VST), one of two dedicated survey telescopes at ESO's Paranal Observatory in northern Chile. A zoomable version of the image allows the viewers to explore the many nooks and crannies of this fascinating object. As well as the nine imaging surveys with VISTA and the VST there are also two additional surveys that are in progress using other ESO telescopes. One, the Gaia-ESO Survey, is using the Very Large Telescope at Paranal to map the properties of more than 100 000 stars in the Milky Way, and another (PESSTO) is following up on transient objects such as supernovae using the New Technology Telescope at La Silla. Some of these surveys began back in 2010, and some much more recently, but data from all of them are now being made public and are accessible to astronomers around the world through ESO's archive. Although they are still in progress, the surveys are already allowing astronomers to make many discoveries. Just a few of these new results include new star clusters found in the VVV survey, the best map yet of the central parts of our Milky Way, a very deep view of the infrared sky and, very recently, some of the most distant quasars discovered so far (from the VISTA VIKING survey).